Why is this such a media magnet? Is it because many people don't identify with orcas or other marine animals as they do with, for example, companion animals and other terrestrial beings? If J-35 were a dog, it's unlikely this story would be such a "hot" media item. J-35 and her pod mates' sad story is a wonderful catalyst for changing our ways and for rewilding ourselves. I hope the tide will turn rapidly so that we all will move ahead and embrace the importance and splendor of all other animals and their homes. In this file photo taken Tuesday, July 24, 2018, provided by the Center for Whale Research, a baby orca whale is being pushed by her mother after being born off the Canada coast near Victoria, British Columbia. 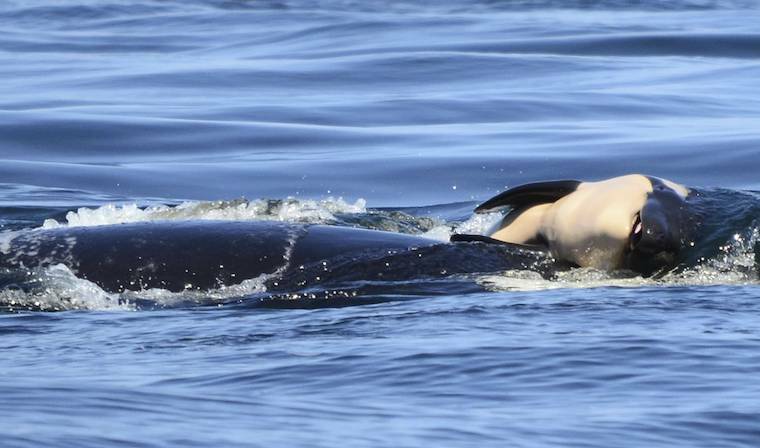 Whale researchers are keeping close watch on an endangered orca that has spent the past week carrying and keeping her dead calf afloat in Pacific Northwest waters. The display has struck an emotional chord around the world and highlighted the plight of the declining population of southern resident killer whales that has not seen a successful birth since 2015. "It's a very tragic tour of grief." I've received numerous emails during the past six days about an orca mother, called J-35, a member of an endangered population of killer whales near San Juan Island, Washington, grieving the loss of her child. It's been a "hot" global media item, and numerous accounts of her and other pod member's behavior can be seen here. J-35 has been observed balancing the corpse on her head and on her nose, and other pod members are also taking turns in what's been called a funeral ritual. Jenny Atkinson, director of the Whale Museum on San Juan Island notes, ""Ceremonies can go on for days to honour and mourn the loss of a loved one...I think that what you're seeing is the depth of importance of this calf and the grief of the mother and the family." Dr. Ken Balcomb, pioneering whale researcher, orca expert, and Founder of the Center for Whale Research, calls it "a very tragic tour of grief." I agree with both of these people and others who know orcas well. If J-35 wasn't grieving along with other pod members, what are they doing? And, why is this such a media magnet? Is it because many people don't identify with orcas or other marine animals as they do with, for example, companion animals and other terrestrial beings? Too many people are "land mammal-centric"
"It's not anthropomorphic to use this label for them...Grief and love are not human qualities. They're things we share with some other animals." As emails came pouring into my inbox, I began to wonder why all the press on J-35's behavior. She's clearly grieving the loss of her child and other pod members are taking turns in the mourning ritual. In addition to what I quote above, Dr. King also notes, "We can't get into the animal's mind, we don't know if she has a concept of death...But it seems to me that she's quite aware that there's something very wrong, that her baby is no longer the way that it should be — and she's so distressed about it that it rises to the level, in my estimation, of grief." (For an interview with Dr. King called "Killer whale holding dead calf afloat is showing human-like grief, expert says" please click here.) We know that captive orcas often go crazy and likely suffer from PTSD when forced to live in tiny water cages (for more discussion please see and and). If they can experience these sorts of negative emotions, why can't they also feel grief, and of course, joy and other positive emotions? I agree with Dr. King, and feel very comfortable saying something like, "make no mistake, orca Mom J-35 and pod mates are grieving." What else can they possible be doing and feeling? In numerous essays and talks I've stressed that while orcas and other animals might not have the same concept of death that many humans have in terms of knowing that a particular individual is "gone forever," we really don't know this. But, lacking a human concert of death does not mean that they don't grieve the loss of family members, including their children, friends, and other individuals. And, who knows, maybe in the future we'll learn that some nonhumans know that when "something is very wrong" or that "something is new and very different," they do realize that an individual will no longer be around. All in all, it's essential to keep the door open to this and other possibilities because detailed studies of the cognitive and emotional lives of nonhuman animals are constantly producing so-called "surprises." Who would have thought that some invertebrates are very bright and likely feel pain, that fishes are smart and sentient beings with distinct personalities (please also see), that mice display empathy, and that rats display empathy for other rats in need, have regrets, cut deals and trade favors with one another, and laugh, and like to be tickled and enjoy playing? Some people used to claim, absent data, that dogs didn't feel jealousy. However, now we know that they do (see also) and that the same areas of the brain light up in neuroimaging studies as in humans when they're experiencing jealousy. The examples go on and on, and the database is growing rapidly. Many people are "land mammal-centric," more familiar with animals with whom they've had direct or indirect contact or whose behavior they can read, and more likely to agree that they experience an array of different emotions. What if J-35 were a dog with an expressive tail, ears, facial expressions, gaits, and postures? I also feel that if J-35 were a dog, chimpanzee, gorilla, elephant, or another mammal with whom people are more familiar and for whom there are numerous stories about their displaying mourning and grief, there wouldn't have been such media hype. Birds also have been observed dismaying mourning and grief (please also see Drs. John Marzluff and Tony Angell's Gifts of the Crow: How Perception, Emotion, and Thought Allow Smart Birds to Behave Like Humans and "Grieving Animals: Saying Goodbye to Friends and Family"). It's much more difficult to read what an orca is feeling because they don't have such expensive tails, ears, facial expressions, gaits, or posture. It's said that a picture is worth a 1000 words. For a picture and a story about a sad orphaned gorilla, please see "A Grieving Gorilla: A Picture That's Worth Entire Courses," and for a video of donkeys interacting with a corpse please see "Donkeys: If They Aren't Grieving What Are They Doing?"). Because orcas don't have display expensive tails, ears, facial expressions, gaits, or postures, we don't have such observable cues as to what they are feeling. However, their behavior, as shown by J-35 and her pod mates, clearly show that they're feeling something and it's best called grief. However, researchers are recording some of J-35 and others' vocalizations, and Ms. Atkinson said, "it's possible the sounds are related to their mourning of the calf — but researchers can't know for sure... We picked up some calls earlier in the week and we hear things that sounded more like a very urgent call...If you think of going to a wake for a family, things can go on for multiple days and the grief is still deep, but the emotions kind of soften." Orcas also have big brains (see also) and there's no reason to think that they don't have the neural apparatus and capacity to feel a spectrum of emotions. As I'm writing this essay, J-35 and her pod mates are still caring for her child's corpse. My take on the situations along with others is that they are not acting as if they are grieving -- they are grieving. The "as if" disclaimer harkens back to times when we didn't know that much about the emotional lives of other animals, and now we know so much it's really unscientific to offer it up to cast doubt on what other animals are truly feeling. If other animals grieve the loss of other individuals, and there are ample data that they do, there's no reason to reject this claim. Ms. Atkinson and other whale experts believe that the whales "are holding their own version of a wake or a funeral," and this is as tenable an explanation as one that claims they are not. Recall Dr. King's comment above, namely, "It's not anthropomorphic to use this label for them...Grief and love are not human qualities. They're things we share with some other animals." Also keep in mind Dr. Balcomb saying, "It's a very tragic tour of grief." If these and other experts draw this conclusion from the "grim vigil," one with which I whole heartedly agree, let's get on with the show and learn more about why grief has evolved, not if it has evolved, in orcas and many other animals. It's singularly arrogant and narrowly and wrongly anthropocentric to think that we're the only animals who grieve. Other animals suffer from broken hearts just like we do. And we need to broaden the spectrum of nonhumans who we study, because focusing on animals with whom we're most familiar or who display clear overt signs of how they're feeling is too narrow a focus. I fear that future generations will be dismayed and wonder how we missed out on understanding, appreciating, and doing something to protect nonhumans who clearly are sentient, feeling beings. How could we fail to recognize their rich and deep emotional lives of these fascinating animal beings? How could we let them down by ignoring what they're feeling even in the face of a growing empirical database? Other animals aren't behaving "as if" they're feeling something. They're really feeling different emotions and it's time to move the conversation forward. Detailed research clearly shows this must be the path for the future, and that we must use what we know on their behalf. In an increasingly human-dominated world, the future of our planet and its enormous and wondrous awe-inspiring biodiversity demand that we do no less. Future generations depend on our goodwill toward all beings and that we strive for peaceful coexistence with the other animals with whom we share our magnificent planet, from tiny organisms who are unknown to many people to enormous and charismatic megafauna with whom so many people are familiar.